Grade: VF, brown patina, minor roughness. Notes: Ex BCD Collection (not in previous BCD sales).Like elsewhere in the Peloponnesus, Mycenaean ruins can be found in Messenia, indicating that it had been inhabited well into the remote past. Such is the case with Pylos, the home of Nestor, whom Homer described as “sweet of speech” and “good counsellor.” During the early Archaic period, Messenia attracted the expansionist gaze of Sparta, owing to the fertility of its soil. Over the next two centuries in a series of wars, Sparta eventually conquered Messenia and enslaved its remaining inhabitants. Known as helots (Gr. ΕἵΛΩΤΕς), the Messenians were tied to the land in agriculture to support their Spartan overlords. They could be ritually abused, humiliated, and even killed; every autumn, as part of the Krypteia, Spartans could slay them without fear of repercussion.In 464 BC, the Messenians revolted, when an earthquake destroyed the city of Sparta. For the next several years, the Messenians held out in defense on Mt. Ithome as they had done previously, but were forced to withdraw under the oversight of Athens. After Spartan power was significantly checked at the Battle of Leuktra in 371 BC, the Boiotian general Epaminondas invited all the Messenian exiles to return home. In 369 BC, the city of Messene was founded and, like Megalopolis to the north in Arkadia, offered a strong curb against Sparta. Following the end of Theban power, Messenia allied itself with Macedon. 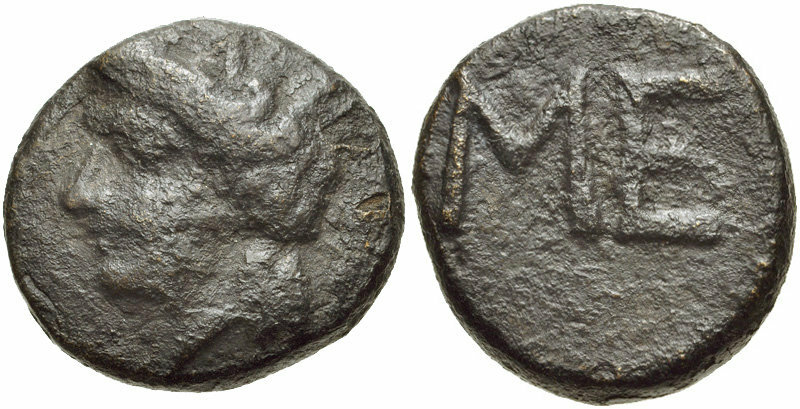 It subsequently joined the Achaian League and struck coinage on behalf of the League. From then, Messenia’s fortunes ebbed and flowed until 146 BC when the Romans incorporated Messenia and its cities into the new province of Achaea.